Auxiliaries: Haya, Daiichi Maru #8, Nanshin Maru#8, Nanshin Maru #31, Taiko, Yodati,all smaller than the first set). Minecraft Enoshima and Ento (also known as the Maroshima). Chinese accounts mention 20-25 "fishing boats"
Many thanks Taki for connecting me to your previous postings as well as those of Tigre and Asiaticus. My source is Volume 2 of Chugoku homen kaigen sakusen (Naval Operations in the China Theater) published by Asagumo Shimbunsha 1974-1975, in particular Page 51. I have the Hui Li Battery with a single 9.2" gun and no data whatsoever for the Pan Shih Battery. Thanks for the work on the Naval end of this, Jerry and Taki. I will see about putting down a narrative derived from Hsu in a while. BTW I wonder if those 9,2 guns were old late 19th century peices like the ones at the Wusung forts. Jerry, you mention Chinese accounts mention 20-25 "fishing boats", is that their fishing boats? Or are they with the Japanese? It looks from the map that they had to evacuate by sea. Hsu Long-hsuen and Chang Ming-kai, History of The Sino-Japanese War (1937-1945) 2nd Ed. ,1971. Translated by Wen Ha-hsiung , Chung Wu Publishing; 33, 140th Lane, Tung-hwa Street, Taipei, Taiwan Republic of China. Pg. 247. The Chinese 4th War Area undertook the garrison of the coast of Fukien. The 75th Division undertook the garrison of Amoy. On May 10, 1938, at dawn, over 30 Japanese aircraft repeatedly bombed coastal postiions northeast of Amoy, while Japanese ships bombarded Ho-tsu, Ni-chin, and Wu-tung to cover the landing of more than 2,000 marines. The main force of the 75th Division fought against them, suffering heavy casualties. Eventually their positions were overrun. The acting division commander Han Wenying was wounded, while two battalion commanders, Sung Tien-cheng and Wang Chien-chang were killed in action. Chinese forces fell back to the line from Chin-chi-shan and Chiang-tou to continue resistance. At dawn on May 11, the Japanese in Wu-tung were increased in strength and broke through Chinese postions at Chiang-tou and Yun-ting-ai. The Japanese headed in the direction of Amoy and the Chinese fell back to the line, from Hu-li-shan to Hsi-ku-ling and Hu-tou-shan. In the night of May 12, Chinese forces abandoned Amoy and moved to Sung-yu. Chinese accounts are that these are Japanese fishing vessels; essentially being used in the absence of the Daihatsu's we've encountered in North and Central China. 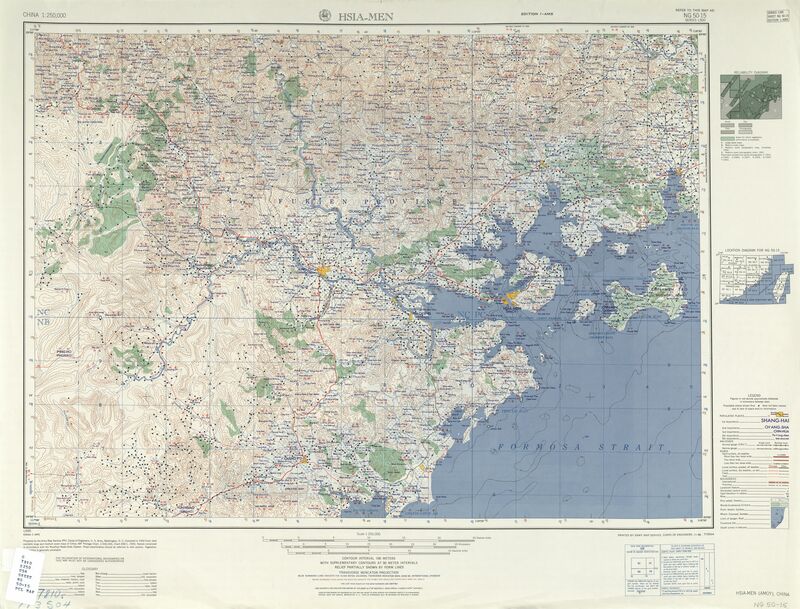 Given the dates of the coastal actions May 1938 Xiamen, June 1938 Shantou, and some lesser actions off Fuzhou, I hazard the guess that the Japanese are concentrating their small shallow draft craft near the Yangzi for the great drive upriver. (Asiaticus--I know you and Taki have worked diligently on Yangzi drive of 1938-but I have another question I'm going to post this weekend). The 9.2" seem to be have been there awhile. Off top of my head, I think they are mentioned in Wright's The Chinese Steam Navy. There was a mass exodus from the Xiamen island, Xiamen City is on west coast of the island, with Kulangyu (today Gulangyu) being the primary destination as it was the "International Settlement" . One source citing that 60,000 people fled to the island in twenty four hours. Found a very detailed description on the net on Chinese Coastal Defence (it's in Chinese); don't know how solid the information is. The 75th Division is one of those poorly equipped provincial divisions; it consists of 4 regiments (445, 446, 449 and 450) which were deployed along the coast near Amoy; with very few reserves further inland. The 3rd Battalion, 445th Regiment udner Wang Chien-chang bore the brunt of the Japanese landings; its 7th Company opposing the landings at Nichin was crushed and its commander killed in the initial fightings. It was forced to retreat to Yun Ting Shan (云顶山). After daybreak the deputy commander of the 75th Division personally led the 1st Battalion of the 445 Regiment to reinforce the 3rd Battalion; it suffered over 50% casualties as it came under heavy Japanese naval fire. The remnants of the two battalions held their ground although their postions were virtually obliterated by Japanese bombardments. The 2nd Battalion was summoned to reinforce the Chinese line; incredibly it did not learn what happened to the 1st Battalion and suffered heavy casualties (its commander Yang Yung-shan was severely wounded) from the Japanese naval fire even before it reached the front lines. The supporting naval forces clearly played a key role in this battle and it was responsible for the virtual destruction of the entire 445th Regiment. By the afternoon of the 7th, the Japanese has circled around the Chinese lines and threatened to encircle the remnants of the 445th Regiment. As night fell, the defenders escaped in small groups, and with no reserve close by, the door to Amoy was open. At around 0800 on the 11th, the Japanese landed near Pai Shih Fort under the support of 3 destroyers and 2 gunboats. Since the ships were out of range for the guns in the fort, the fort was abandoned. The Japanese then attacked the neighbouring forts at Hu Li Shan (胡里山) and Pan Shi (磐石) and scattered the defending artillerymen. Amoy was now virtually defenseless except for some local militia; they were scattered and then gunned down as they tried to escape by jumping into the sea. Chinese after-action reports showed the effect of the naval bombardment: all bridges, roads, ferries and ships were targeted causing major disruption in communication and heavy personnel losses; one of the reinforcing regiments could not get its orders to move forward because its communication lines were all cut. The Chinese troops tried to put up a fight, but were hampered by poor deployment of the troops (all troops deployed near the coast and hence little chance for reinforcement) and vast disparity in firepower between the two forces. Note that its description claimed that the Chinese troops trapped within the fort did not give up and repelled all Japanese attacks, and eventually have to be evacuated with the aid of neutral (American and British) vessels. This clearly contradicted the account given above, not sure which is correct. 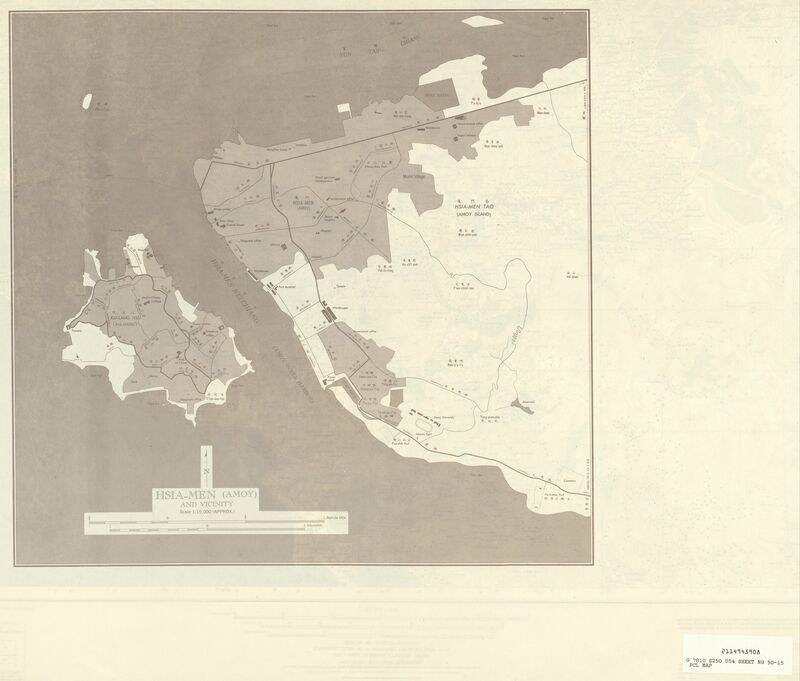 Can anyone provide good data re the presence of US naval vessels off Amoy, or more precisley Kulangsu, in May 1939? Brice states EDSALL & HMS STRONGHOLD, but British & American diplomatic communications show only BULMER, and mention no others. My notes are that the Chinese Customs crusier Ping Ching (no further data) and British DD Diana are present. USS Ashville had sailed on the 9th and returned at 1500 hours on the 11th. USS Marblehead arrived a few days later, then the British Dorchester, then Birmingham, then Defender and Scout (uk dd's) then two more USS DD's Bullmer and Edall and then the French Emile Bertin and Lamott-Picquet. Quite a regetta. Intresting details are still sparse relating to IJN--maybe can back into via the coastal defense exhibits. In a nutshell, a Chinese gentleman was "murdered" (on May 11th) & this set off the Japanese reaction. BIRMINGHAM departed 5/26 after holding a series of talks on board; she took ADM Noble, British commander, with her. Negotiations dragged on through the summer and into the fall. When the Japanese landed 150 men, the Americans, French, and British each landed 42-man parties. In July talks resumed between the commander of South China Patrol, Asiatic fleet, CDR STAPLER and the IJN officer in charge at Amoy, RADM MIYATA (?) but MIYATA refused to take responsibility for the blockade, saying it was the responsibility of VADM KONDO, Nobutake, C.O. of IJN's South China Fleet. In October, 1939 an agreement of some type was reached, but by the following January an almost identical 'incident' occurred again and the scab knocked off...by March 22, 1940 the gunboat ASHEVILLE had to return to Amoy/Kulangsu. This is more or less the extent of my knowledge of the 1939 incident, & I make no claims to veracity at this point. Two Japanese plans (general and a part of detail) of this operation.